The SEDEX is a social accountability standard developed by a not-for-profit organization and it is used globally to do business that is good for everyone. The SEDEX certification - Supplier Ethical Data Exchange certification requires specific documentation in compliance with social accountability requirements. SEDEX documents guide organization's on world's largest collaborative platform of buyers, suppliers and auditors to store, share and report on information quickly and easily. Primary documents, such as SEDEX procedures, safety and hazardous policies, rules and regulation guide, formats, SOPs, checklists etc, are the most significant part of documentation process while SEDEX certification for any organization. We offer SEDEX Certification Consultancy and Documentation Kit for SEDEX Certification. The Documentation kit for SEDEX Certification is designed to help organizations for social accountability requirements as per Supplier Ethical Data Exchange standard. This readymade tool - documentation for SEDEX helps in accelerating process and results for quick and effective certification. The SEDEX documents are designed with easy editing features and compatible with clause-wise requirements of social accountability standards. The users can update SEDEX documentation templates as per their products and organization working system, which helps them to complete documentation process for SEDEX certification in short time. Standard Operating Procedures (35 SOPs). SEDEX Policies (11 sample policies). Social Committee and Meeting Records (05 files). Rules and Regulations Registers (07 files). Set of readymade blank formats (51 sample forms). Emergency Preparedness Plan (08 SOPs). SEDEX Audit Checklist with more than 100 audit questions. The total SEDEX Documents for social accountability requirements are provided in editable format, so that anyone can easily modify and update them as per their organizational requirements. This documentation set will guide users to achieve SEDEX certification quickly and our documentation package is competitively priced and many clients worldwide have purchased it and used it during SEDEX implementation and certification. Users can easily make changes in the given SEDEX templates as per their working system and create their own documents for SEDEX certification. Procedures and formats provided in the documentation kit can help in fine-tuning the processes and establishing better control over ISO 3834-2 requirements. Ready-to-use documents in .doc format reduce your time in documentation process. 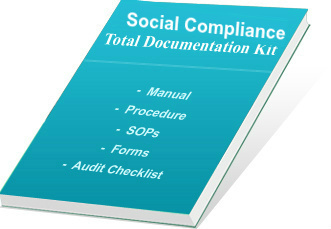 Our documents are useful in training of staff for learning social accountability requirements. The documentation kit will save much time and cost in document preparation. It gives value for money to customers. Takes care for all the sections and sub-sections of SEDEX, which gives confidence as well as increases trust of employees and customers. It can be used as a ready-to-use tool while making documentation like SEDEX policy, procedures, forms and audit checklists for quick certification. On successful completion of payment process, we provide username and password to download softcopy from our FTP server. Delivery of our products will be within 12 hours of payment confirmation by secure third-party payment gateway. View free Demo of Documentation Kit and purchase it with secure online transaction.